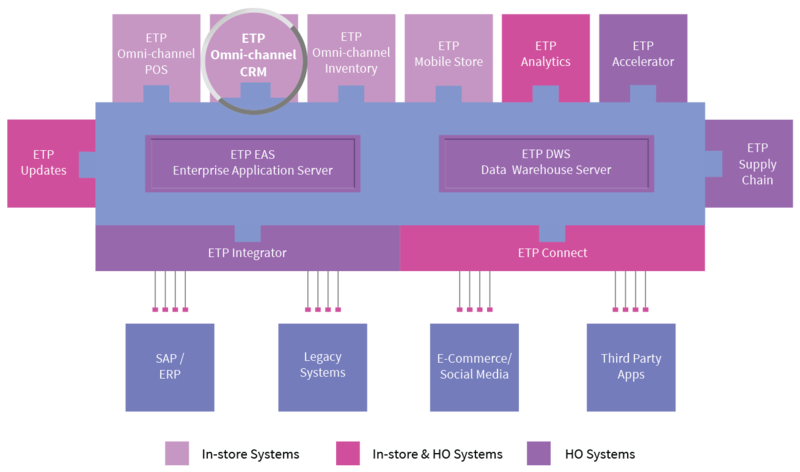 ETP Omni-channel CRM solution is integrated with the ETP Omni-channel Store Solution and it connects the business back-end operations with the supply and demand channels. This ensures the customer can peruse, pick, purchase, like, promote, review, search, seek information and provide feedback from anywhere at any time. Using the omni-channel retail CRM software, channel-based promotions can be developed, tracked and modified while capturing valuable customer feedback. It provides seamless visibility with a dedicated OMS engine to optimize customer order fulfilment. Customers are delighted with personalized offers and empowered with multiple retail channels, modes of payment and delivery options which further aid sales frequency. The ETP Omni-channel Retail CRM software integrated with the ETP Omni-channel POS solution ensures improved brand visibility, sustained engagement, easy access to products and cross/up-selling promotions to increase the revenue per customer steadily.